Strong outlook in automobile application to decrease production costs and time should positively influence conveying equipment market size. Increasing infrastructure investment in China, Malaysia, Indonesia, Thailand and India should fuel the product demand. Malls and Airports construction project developments especially in India and China would drive market growth. Increase in spending capacity due to rise in population with more employment opportunities might fuel the product demand in APAC region. Total infrastructure expenditure in China was at above USD 1.4 trillion at the end of 2015, which accounted for about 50% of the total APAC construction spending. Increasing automation trend has led to installation of conveying systems in manufacturing units. These are used in public & private mail handling and airport luggage operations. Growing fixed investments among non-residential due to industry related capital investments should enhance conveying equipment market size. Production and transfer of automotive should boost product demand. Automotive production need these systems including pallet movers for shipment and conveyors for manufacturing. Global automobile production has witnessed growth from 77.6 million units at the end of 2010 to 91.5 million units by 2015 with production increasing particularly in BRIC countries. Rising capital outflow due to worldwide trade deficit leads to low capital investment. Increasing shift towards e-commerce trend with change in distribution channel pattern from the suppliers to the consumers with growth in food & beverages industry, needs horizontal production & delivery of goods simultaneously, which are probable opportunities for conveying equipment market growth. Raw materials including rubber, coated fabrics, polyester, cotton and steel may witness supply shortfall to manufacturers which may pressurize conveying equipment market price trend. Some chemical manufacturers, Spradling Brands and Omnova Solutions provide polyester based materials made up of PET, PA, TPO, PVC and TPU, which are required for developing traction layer used in belts of conveyors. Unit handling conveyors market size generated over USD 17.5 billion for 2015. It is used to maintain sustainability by reducing energy consumption & enhancing production output. Installation of these systems decreases maintenance costs and need minimum service. Unit handling conveying equipment is utilized for small production groups and finds application in vehicle shipment, food & beverages and automotive industry. 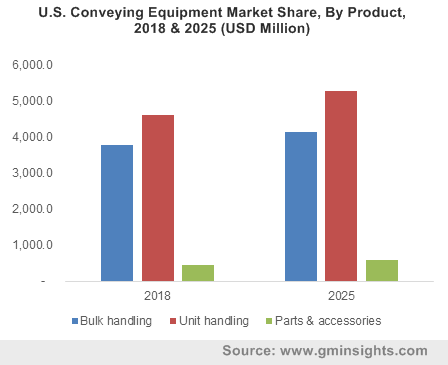 Bulk handling conveyers market should witness gains at above 2% by 2024. It is required in the process of loading & unloading of goods. Mass handling product portfolio includes rotary air valve, coal belts, ash handling system, coal handling system, , rotary air lock, truck loaders, rotary feeder and truck loading machine. Usage of coal as fuel in India and China should boost conveying sysrems market size growth. Conveying equipment market size from durable good applications should register over USD 15.3 billion by 2024. Increasing production output and rapid industrialization is directly related to conveying systems market growth. Introduction of assembly line methods and mass production in various industries has led to conveyors market demand. Vehicle industry is majorly uses these systems to reduce manufacturing cost and time. Conveying equipment market size from non-durable product applications should witness gain at over 1.2% by 2024. This application uses single selective conveyors and are mainly used for food & beverage industry. Europe, led by Italy, France, UK and Germany, conveying equipment market size, should generate over USD 13.5 billion by 2024. Increasing automation in automotive and mining industry may boost regional product demand. Presence of automobile industry and reducing human effort in production plants & distribution centers would positively influence market size. APAC, dominated by China and India conveying equipment market size, was at above USD 10.2 billion in 2015. Increase in manufacturing bases and growth in infrastructural spending should drive regional product demand. Automobile manufacturing companies are planning to invest in APAC due to availability of low labour wages and favourable government norms. Indian manufacturing industry are inclining to specialized manufacturing process which may boost market demand. U.S. durable goods industry includes computers, automobile and electronics witnessed a deteriorated output from 2009 to 2011. U.S. conveying equipment market size should grow steadily with stable rate of production and shipping activities due to macroeconomic impacts. LATAM, led by Brazil market size should surpass at over USD 1.8 billion by 2024. Increasing automobile production in Brazil, would influence regional market growth positively. Government norms along with increasing privatization and globalization in MEA countries mainly UAE, Saudi Arabia and South Africa should enhance industry growth. Global conveying equipment market share is fragmented with top three industry players constituting 30% of overall demand. Some companies operating in this market include Sandvik, Dematic, Rexnord, Webster, FMC Technologies, Richards Wilcox, Hitachi, Seimens, Daifuku, Intelligrated, Nordstrong Equipment, Fritz Schafer and Fenner Dunlop. Sandvik manufactures conveyors and caters to end-use industries which includes mining, terminal & ports, aggregates and cement. Dematic Group provides intra-logistics and solutions associated to material building industry. Some companies also offer software solutions which includes warehouse and vendor management system to enable e-commerce practises. Conveying equipment is used for exports and imports or delivery consignments from one place to another for consumer and heavy industrial goods. Some key market players including Schneider Electric Fenner Dunlop and Demantic, provide products and services to mining, aerospace, construction and manufacturing industries. The surface design uses polymer and rubber coated fabrics and materials including EPDM, silicone, NBR and cotton textiles. Steel is majorly used in producing parts and attachments is obtained from iron & steel companies.